In my family, you cannot get away without having pumpkin pie on the Thanksgiving dinner table. Specifically Grandma W’s pumpkin pie recipe. But it is not yet Thanksgiving (and in reality I’m not going to my parent’s house this year, and therefore I can do whatever I want without my father losing his sh_t), so I’m going to play around a bit. These Sweet Potato Pie Bars are just a little bit of a deviation from my family’s Thanksgiving norm. They are flavored pretty similarly to pumpkin pie, and I added a pinch of cloves to the recipe’s cinnamon and nutmeg, making them even more alike. I used a whole roasted sweet potato and puréed it (like lovielou did) because I think it’s more tasty than the canned stuff, and it made a nice thick filling because it’s also less watery. The sweet potato filling gets baked over a base of sweet tart dough. You can serve these as is, or add toasty marshmallows on top. Truth be told, I’ve never been crazy about marshmallows, so I made a mascarpone-whipped cream concoction, spiked with rum because I know my father would approve of that, to swirl on top. I liked these cold from the fridge. Although Dorie says they’re best the day they’re made, I thought they held up really well for the three days it took us to eat them. For the recipe, see Dorie’s Cookies by Dorie Greenspan. Don’t forget to check out the rest of the TWD Blogroll and please join us if you haven’t already. Happy Thanksgiving! Sometimes I just don’t want to share a dessert. When I want my very own cake, I have a cupcake. 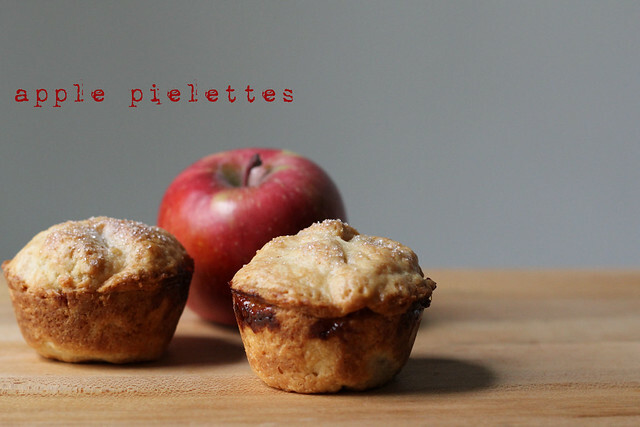 When I want a pie all to myself–let’s not talk about the time I ate an entire Mrs. Smith’s for dinner– these Apple Pielettes, made in a muffin tin, will fit the bill nicely. This recipe uses Dorie’s galette dough. I don’t think we’ve made it before, but it was easy to do in the food processor and easy to work with. Remembering the kuchen from a few weeks ago, I was mentally prepared to be annoyed fitting the dough into cavities of the muffin tin, but this was actually no problem at all (although you’ll probably find that you need to cut your dough circles slightly larger than the recipe states if you really want to fill the tins). The dough baked flaky and crisp…I’d use it for big-girl pies, too. 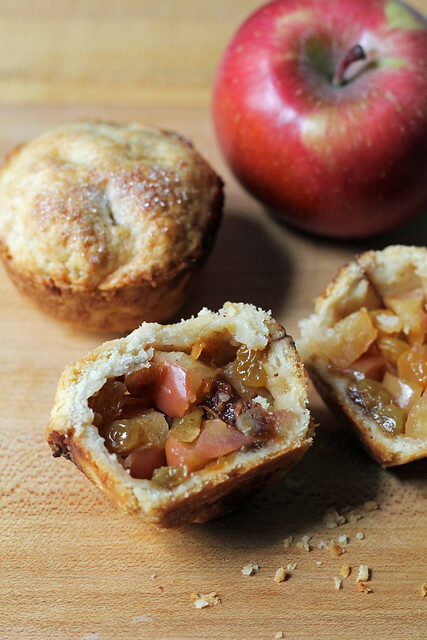 The filling is nice, with apple, of course, (which I didn’t bother to peel) and flavors from dried apricots, raisins and a bit of orange marmalade. If you are an all-American apple pie purist, I’m sure you could fiddle with the insides to get just what you want. After all, it’s your very own pie. For the recipe, see Baking Chez Moi by Dorie Greenspan. Don’t forget to check out the rest of the TWD Blogroll! 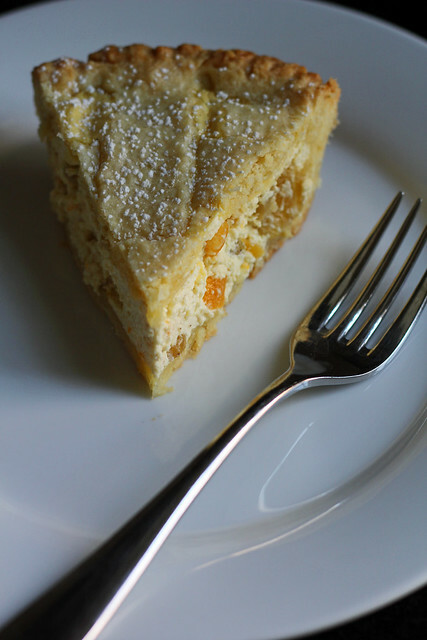 This Sweet Ricotta Pie from Nick Malgieri is the dessert version of his Pizza Rustica, which we made a few Easters ago. It’s made with the same sweet, cookie-like pasta frolla dough and also has a ricotta-based filling. Apart from the ricotta (and few eggs to bind), the filling is pretty simple and is just flavored with sugar, anisette and cinnamon. I’m not wild about anisette, and thought the filling could use a little more pizzazz anyway, so I tweaked it a bit. I had a small handful candied orange peel left from this year’s batch of Hot Cross Buns, so I soaked that, along with some golden raisins, in a good amount of Grand Marnier. I kept the cinnamon, but stirred it into the filling along with the dried fruit (rather than sprinkling it in a layer on top). This pie has good orange flavor, but the filling’s a little dry. If I make this one again, I may try adding a few tablespoons of heavy cream to the batter or try swapping out a couple of the whole eggs for just yolks to see if that adds more moisture. I like the pasta frolla dough, too, although I wish the lattice strips had gotten a little more color in the oven. Looking back, I see that with the Rustica, I eggwashed the lattice for some browning action…seems I always look back a little too late. For the recipe, see Baking with Julia by Dorie Greenspan. Don’t forget to check out the rest of the TWD Blogroll. I’ve done a pretty traditional LMP here before, so I guess it’s time to try out Gale Gand’s Not-Your-Usual Lemon Meringue Pie. 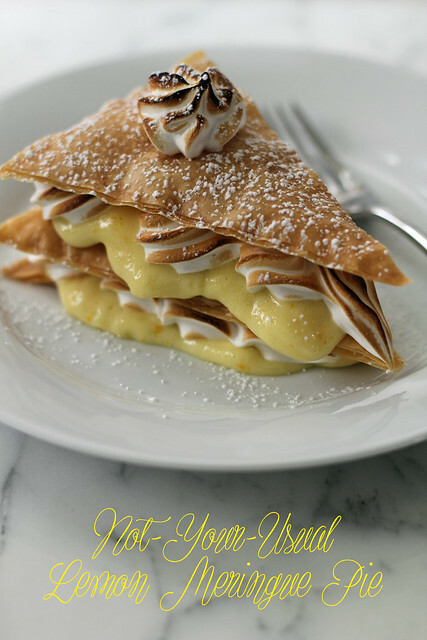 Forget about making pie crust for this– lemon curd and meringue are sandwiched Napoleon-style between layers of crispy sugared phyllo dough. BTW, based on the previous Gale Gand stuff we’ve made, I was not at all surprised to see phyllo pop up here. This is a pretty dessert and it’s pretty straightforward, too. It does need to be served fairly soon after it’s stacked up, but you can make the lemon curd and bake the phyllo crisps plenty ahead of time. Wait till the last minute to get the brown sugar Swiss meringue done, though. We liked this “pie” a lot. The pretty layers do smoosh as soon is they’re hit with a fork, but that’s okay. The lemon curd is a gentle one…not too puckery. The recipe left me with extra curd, which is no problem in my books, but I would recommend reducing the meringue amount by at least a couple of whites, if not by half. For the recipe, see Baking with Julia by Dorie Greenspan (it’s also here). Here’s a video of the BWJ episode (this dessert is in the second half). Don’t forget to check out the rest of the TWD Blogroll! I grew up in Virginia. Just as soon as I moved up to Boston for college, my family moved out to Seattle. I go visit once or twice a year (I was just there a couple of weeks ago, in fact), so have a fondness for Seattle. Being a born Southerner, I also have a fondness coconut and for cream pies, and, interestingly enough, Seattle has a legendary combo of the two– Dahlia Bakery’s (and Lounge’s) Triple Coconut Cream Pie. It is dangerously good, and I’ve been holding off making it at home until I had a real excuse. The Seahawks’ Sunday performance was good enough for me. 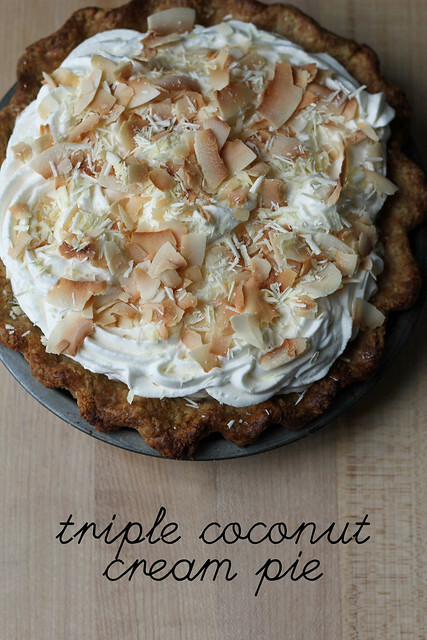 This pie has a coconut crust, a coconut filling and toasted coconut on top…hence the whole “triple” thing. You’ll notice the recipe instructions are…ummm….lengthy. Nothing’s hard, though, especially if you break it up a bit. With a multi-step pie like this, I like to get ready the day before by processing my crust, letting it chill a bit and then getting it in the pan. That way it can really set in the fridge overnight, which not only helps it hold a better crimp while baking, but it means a lot less work the following day. Another crusty trick I have up my sleeve is that after the crust is fully baked, but still piping hot, I paint a touch of egg white on the bottom. It gives it a little barrier of protection from the soft filling and helps keep it crisp. Usually the residual heat coming off the pie shell will set the egg white straight away, but you can always pop it back in the oven for about a minute to make sure. You can also make the coconut pastry cream a day ahead if you’d like…just keep it airtight in the fridge overnight with some plastic wrap pressed on the surface. This coco pie is soft but crisp, rich but light. It’s no wonder, really, that Dahlia has sold something like 350,000 of these things. 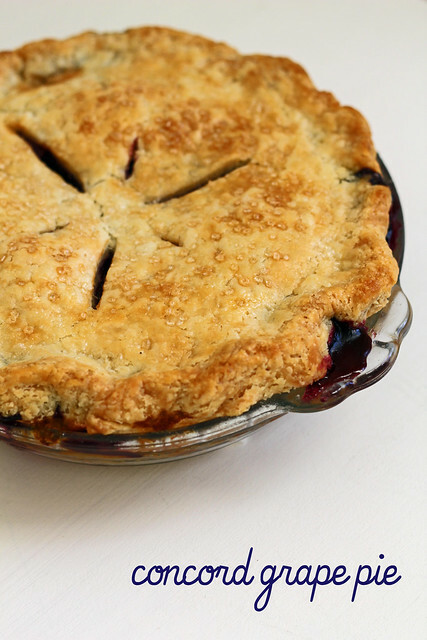 Steph’s Notes: The crust must be baked and cooled before you can fill your pie. If you’d like, you can “seal” the bottom your just-out-of-the-oven hot crust with a little thinly brushed on egg white…this will help keep it crisp when it’s filled. I also like to go ahead and toast the coconut chips for garnish while I have the oven on during this step. 400° is a little high for coconut, so I do this while the oven is coming up to temp or after I’ve turned it off and it’s coming back down (watching closely so it doesn’t burn). -In the bowl of a food processor fitted with a metal blade, combine flour, coconut, sugar and salt and pulse two or three times to combine. Add the diced butter and pulse to form coarse crumbs. Gradually add water, 1 tablespoon at a time, pulsing each time. Use only as much water as needed for the dough to hold together when pressed gently between your fingers (don’t work dough with your hands, just test to see if it is holding). The dough will not form a ball or even clump together in the processor, it will be quite loose. -Place a large sheet of plastic wrap on the counter and dump the coconut dough onto it. Pull plastic wrap around dough, forcing it into a rough flattened round with the pressure of the plastic wrap. Refrigerate 30 to 60 minutes before rolling. -When ready to roll dough, unwrap round of coconut dough and place it on a lightly floured board. Flour rolling pin and your hands. Roll out dough in a circle about 1/8-inch thick. Occasionally lift dough with a bench knife or scraper to check that it is not sticking, and add more flour if it seems like it’s about to stick. Trim to a 12- to 13-inch round. Transfer rolled dough to a 9-inch pie pan. Ease dough loosely and gently into pan. You don’t want to stretch dough at his point, because it will shrink when it is baked. -Trim any excess dough to 1- to 11/2-inch overhang. Turn dough under along rim of pie pan and use your fingers and thumb to flute the edge. Dock the bottom of the shell with a fork. Refrigerate unbaked pie shell for at least 1 hour before baking (this prevents the dough from shrinking in the oven). -When ready to bake piecrust, preheat oven to 400°F. Place a piece of parchment in pie shell, with sides overhanging the pan, and fill with dried beans or wieghts (this prevents the bottom of the shell from puffing up during baking). Bake piecrust for 20 to 25 minutes, or until pastry rim is golden. Remove pie pan from oven. Remove paper and beans and return piecrust to oven. Bake for an additional 10 to 12 minutes, or until bottom of crust has golden brown patches. Remove from oven and allow pie shell to cool completely. – In a medium saucepan over medium-high heat, combine milk, coconut milk and shredded coconut. Using a paring knife, scrape seeds from vanilla bean and add both scrapings and pod to milk mixture. Stir occasionally until mixture almost comes to a boil. -In a medium bowl, whisk together eggs, sugar and flour until well combined. Temper eggs by pouring a small amount (about 1/3 cup) of scalded milk into egg mixture while whisking. Then add warmed egg mixture to saucepan of milk and coconut. Whisk over medium-high heat until pastry cream thickens and begins to bubble. Keep whisking until mixture is very thick, 4 to 5 minutes more. Remove saucepan from heat. Add butter and whisk until it melts. Remove and discard vanilla pod. -Transfer pastry cream to a bowl and place it over another bowl of ice water. Stir occasionally until pastry cream is cool. Place a piece of plastic wrap directly on surface of pastry cream (to prevent a skin from forming) and refrigerate until completely cold. The pastry cream will continue to thicken as it cools. Steph’s Notes: This is a ton of whipped cream! If you’d like to be a little less extravagant here, cut it in half and you’ll still have plenty of topping. -In an electric mixer fitted with a whisk attachment, whip heavy cream with sugar and vanilla extract to peaks that are firm enough to hold their shape. -Preheat oven to 350°. Spread unsweetened coconut chips (or large-shred coconut, or sweetened shredded coconut) on a baking sheet and toast in the oven for 7 to 8 minutes, watching carefully (coconut burns easily) and stirring once or twice until lightly browned. Remove from the oven and allow to cool. -When pastry cream is cold, fill pastry shell, smoothing the surface with a rubber spatula. -Transfer whipped cream to a pastry bag fitted with a star tip and pipe it all over the surface of the pie (or just mound it on top and swirl with a spoon). 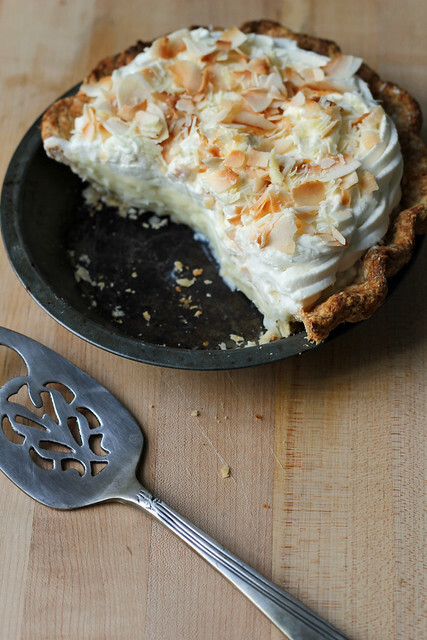 -Sprinkle toasted coconut over top of pie. 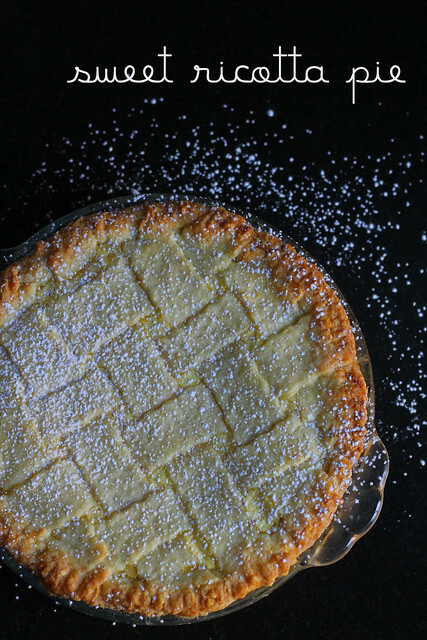 Use a vegetable peeler to scrape about 2 ounces of white chocolate curls on top of the pie (or you can cut pie into wedges, garnish each wedge individually on the plate) and serve. -Store the pie in the refrigerator. I’m not making Thanksgiving dinner myself this year. You never know what you’re gonna get when you’re not in charge, so I had to make a pre-Thanksgiving pie for the two of us here at home. I mixed things up from the typical pumpkin pie by making a sweet potato one. To tell you the truth, I think that pumpkins and sweet potatoes can make pretty interchangeable pie fillings in terms of taste, because they’re often identically spiced. This pie, though, mixes it up a bit in the spice department. It’s a little more ginger-heavy than most– a little more zippy– and leaves out the traditional cloves entirely. When I make a pumpkin pie I normally reach for a can-opener, but this filling uses a fresh-roasted sweet potato. If you have a big potato left over from last night’s dinner, you can use that, no problem. 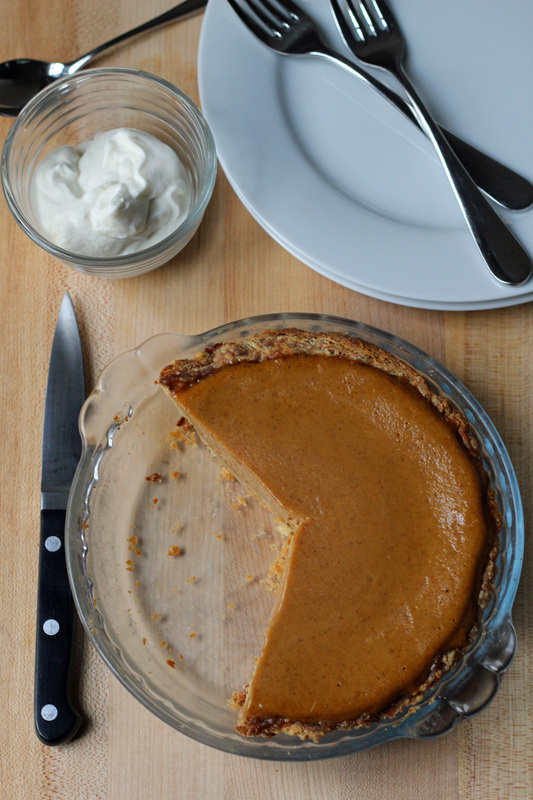 Using a fresh sweet potato for a custard pie gives a slightly different texture than canned pumpkin does. 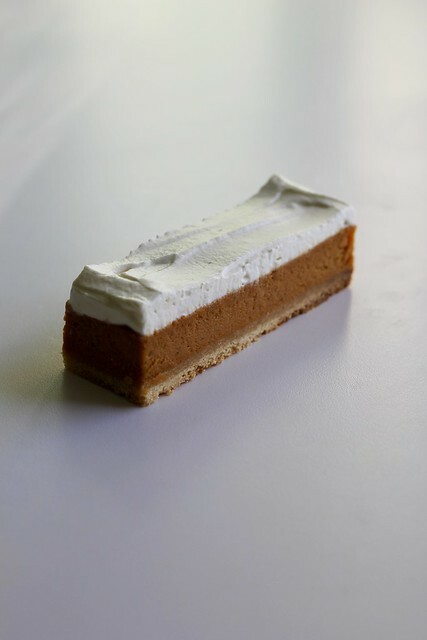 The sweet potato filling is not quite as velvety smooth as pumpkin filling– it’s a little more dense and substantial. 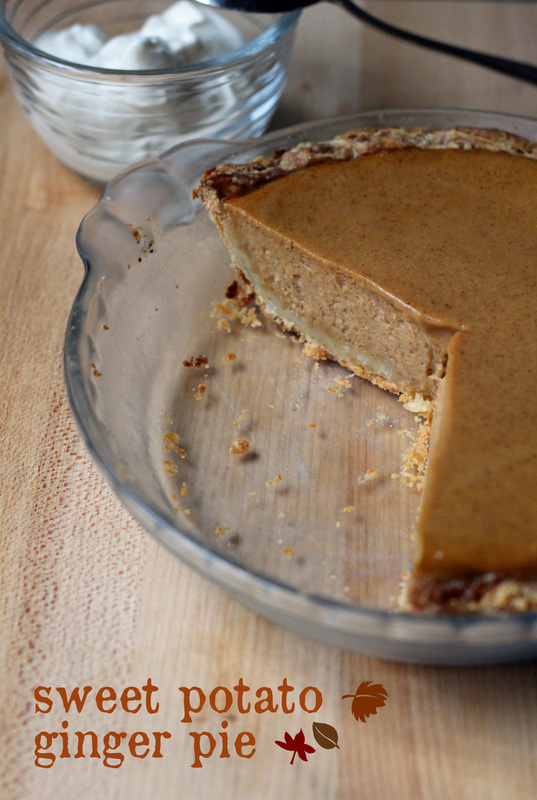 Steph’s Note: To speed things along, you can cook the sweet potato in advance or use a leftover one for this pie. Just bring it to room temperature before processing the filling. -To make the filling, cut a slit into one large sweet potato and wrap tightly in foil. Bake at 400°F until sweet potato is very soft, about an hour. Let cool. -Meanwhile, on a lightly floured surface, roll out the piecrust to a 12-inch circle. Transfer the crust to a 9-inch pie plate. Fold over any excess dough, then crimp as decoratively as you can manage. -Prick the crust all over with a fork and freeze it for at least 15 minutes. Cover the pie with aluminum foil or parchment and fill with pie weights. Bake at 400°F for 20 minutes (you can do this while the sweet potato is also in the oven). Remove the foil or parchment and weights and bake until golden, about 5 to 10 minutes more. Cool on a rack until needed. -Scoop 1 cup of cooked, cooled sweet potato into food processor, discarding skin. Reduce oven temperature to 325°F. Add all remaining filling ingredients to food processor and puree until smooth. You can skip this, but if you want to smooth the filling out a bit more, strain it by pressing through a fine sieve. -Spoon filling into pie crust and spread until flat and even. Place pie on a rimmed baking sheet and bake until the custard is mostly firm and set but jiggles slightly when moved, 45 to 55 minutes. Let cool to room temperature and serve with whipped cream. 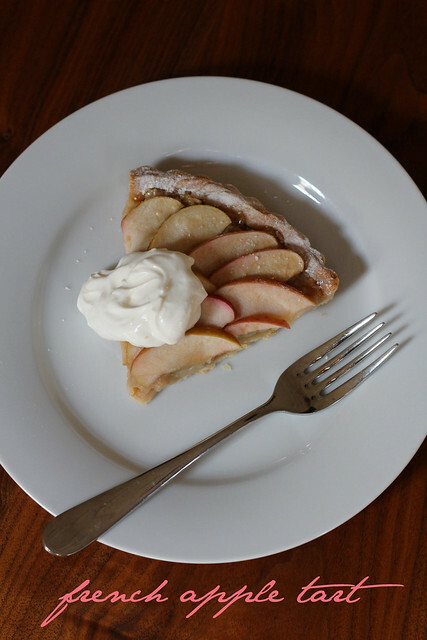 I made Leslie Mackie’s French Apple Tart back in the fall, when I had heaps of pink-skinned apples from my CSA. Good thinking, because the apples I’ve had lately haven’t been so great. If the tart looks a little familiar, maybe that’s because it’s a sister to the Normandy Apple Tart we made in TWD 1.0 about a year ago. This tart is easy to make, but it isn’t a quick throw-together. Get prepared…you can do some of these things in advance. You need pie dough, apple compote for the filling (this one’s made in the oven) and lots of thinly sliced apples to spiral on top. It certainly is pretty, though, not to mention delicate and delicious. Your friends will think it came from a pâtisserie. For the recipe, see Baking with Julia by Dorie Greenspan or read Gaye’s Laws of The Kitchen. It’s also here (and there’s even a video of Leslie and Julia making the tart together). Don’t forget to check out the rest of the TWD Blogroll! Last Saturday, my CSA workshift rolled around (cuz you know, apparently CSAs are socialist). To tell the truth, I was kind of dreading standing there for three hours early on a weekend morning, but as it turned out, the weather was great and I got the job I wsa hoping for. I got to weigh out the coveted concord grapes that were last week’s fruit share. Actually I got to dole out both grapes and advice. Pretty much everyone who came through asked what to do with them. How about eat them…juice them…jam them…pie them?!?! Being the grape mistress also meant I got first dibs on leftovers when we cleaned up. I took home a few extra stems…enough in total to make both concord grape jam and a little pie of my own. Concord grapes are like the grapiest grapes there are. They’re the grapes that “grape-flavored” things imitate. And they are the most dreamy shade of purpley blue. When I recommended to my fellow CSA-ers that they make a pie, most of them looked at me like I had two heads. 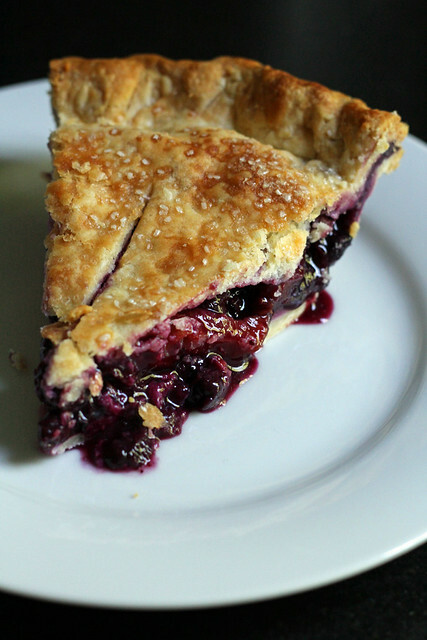 I guess a grape pie does sound a little weird, but it is so, so delicious. Jammy and sweet and purple. Now that I’ve talked up these grapes, here’s the bad news. They have seeds. Hard seeds that are unpleasant to eat, and IMO must be removed. Making a pie from them is a labor of love, but I’m willing to put in the time to de-seed. I don’t mind so much turning on the radio and zoning out with a little kitchen prep. Anyway, it is a once a year treat, and the time spent makes every bite taste that much better. Steph’s Note: If concords aren’t available where you live, or you’d like a more year-round, less labor-intensive alternative, see the original recipe (which uses seedless red grapes). -Slice grapes in half and remove the seeds. Transfer grapes (and their skins, which tend to easily slip off–don’t worry about it) to large sieve set over large bowl. Drain off grape liquid, saving 2 tablespoons. -Whisk 3/4 cup sugar, cornstarch and salt in another large bowl to blend. Mix in drained grapes, reserved juice and squeeze of lemon juice. -Preheat your oven to 375°F. Roll out one disk of dough on floured surface to a 13-inch round; transfer to pie dish. Brush dough edge with egg glaze. Fill with grape mixture. Roll out the second disk of dough to a 12-inch round. Top pie with dough; trim overhang to 1/2 inch. Roll edge under and crimp. Brush top of pie with glaze; sprinkle with raw sugar. Cut several slits in top crust to allow steam to escape. Chill the pie until your oven is fully heated. -Bake pie until golden and juices bubble thickly, 60 to 70 minutes, slipping a baking sheet under the pie plate at the halfway point. Cool the pie on a rack to warm or room temperature, 2 to 3 hours. You should think about having vanilla ice cream on hand. This week it’s Thursday with Dorie. Oops, someone didn’t pay attention…my bad. Anyway, here is Flo Braker’s Crunchy Berry Galette, made instead with peaches and red currants from my CSA. 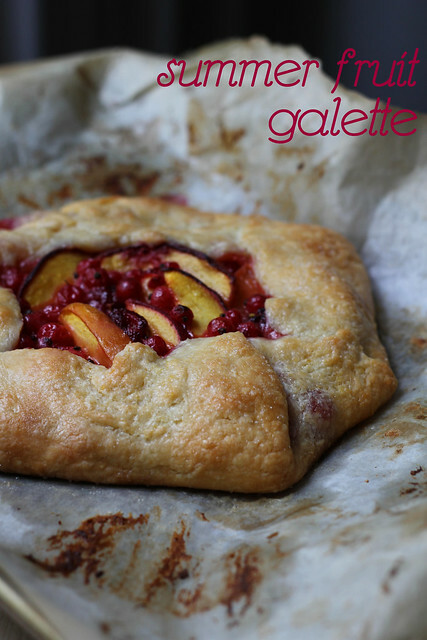 A galette is a freeform pie. I make little individual ones everyday at the shop where I work, but we call them crostatas, cuz we’re Italian like that. This galette has an unusal dough…it’s not a flaky pie pastry. It gets it’s crunch from cornmeal and softness from sour cream. The dough is seriously sticky, but I rolled and formed it directly on the parchment I used for baking, so I didn’t really have issues with it. I added a tiny spoon of cornstarch to the filling just to tighten it up a bit. I still had a little leaky juice, but no major explosion. This was small, perfect for two with ice cream. For the recipe, see Baking with Julia by Dorie Greenspan or read Lisa’s Tomato Thymes in the Kitchen and Garden and Andrea’s The Kitchen Lioness. It’s also here. Don’t forget to check out the rest of the TWD Blogroll! Yeah, I know that just a couple of weeks ago I declared crisp to be the new pie. And now here I am with an old school pie. A big pie, too…not my normal half-sizer, but a full nine-inch pie. A pie that I can eat while I watch the Olympics– ha! 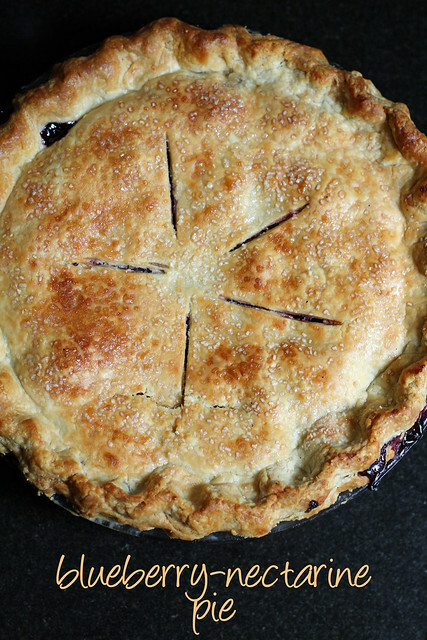 Leslie Mackie’s Blueberry-Nectarine Pie is actually a favorite recipe. 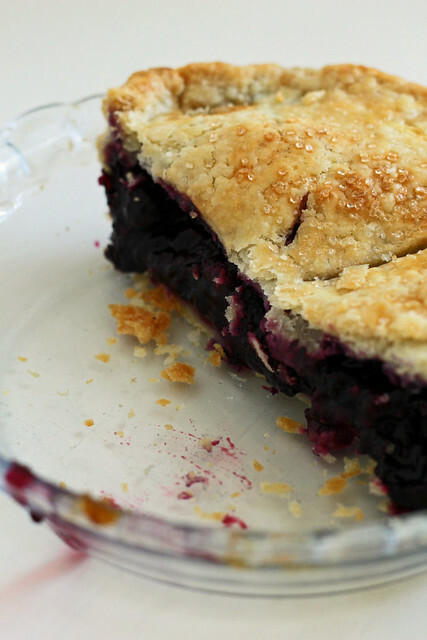 I’ve made this pie several times in summers past and it’s always great. I really love nectarines, even more than peaches, I think. There are a couple of wacky instructions in the recipe that I don’t go by. First, it says to assemble the pie in a one-inch tall nine-inch cake pan. That’s weird…why not use a pie pan? I do. Then it says to cool the pie for 30 minutes before cutting. Trust me, it needs to cool much longer than that if you don’t want your filling to pour out when you slice it. I always try to bake my pies in the morning, so that by dinner time, they are well-set. By the way, I spent last week on the West Coast, mainly visiting my family in Seattle. I had my mother take me to Mackie’s Macrina Bakery in SODO one afternoon. I didn’t see this pie there, but the breads are amazing. For the recipe, see Baking with Julia by Dorie Greenspan or read Hilary’s Manchego’s Kitchen and Liz’s That Skinny Chick Can Bake. It’s also here. Don’t forget to check out the rest of the TWD Blogroll!